The Finnish communications giant demonstrated two foldable, 5.9-inch OLED panels at the annual Display Week conference in San Diego earlier this month, according to Nikkei Tech. The panels were jointly developed by Nokia SEL and Japanese subsidiary Advanced Film Device. One of the panels can be folded down the middle, while the other can be folded in two places much like a pamphlet. 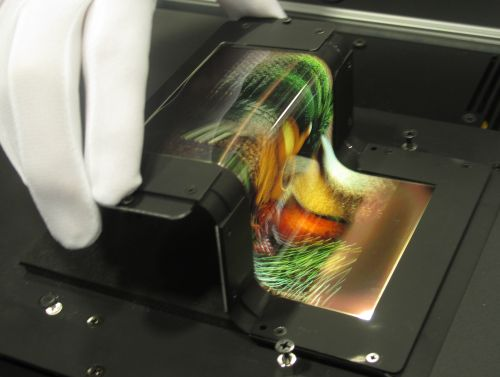 Both 1,280-pixel-by-720-pixel displays can continue display video while folded and are manufactured using a special technique that sandwiches the color filter, TFT, and OLED layers between a sealer and a flexible substrate. While neither panel can be folded completely like a piece of paper, the fold radius is impressively small and each can be folded and unfolded more than 100,000 times. The single-fold display can be bent to 2 millimeters, while the dual-fold panel can withstand a 4 millimeter curvature. Despite publicly panning OLED technology in the past, Apple is rumored to have changed its tune when it comes to the so-called "iWatch." Recent reports have indicated that Apple may be planning to utilize a flexible, curved OLED display in the new wearable that would allow for a more sleek, form-fitted design than competing smart watches. Though concept devices featuring curved or folded designs have existed for more than a decade, the only such products to make their debut have been mobile phones and televisions sporting slightly curved displays. Apple's ample engineering resources and massive war chest put the company in a unique position to fully realize the potential of OLED displays to enable totally new device designs. Apple has also been seen taking a keen interest in foldable OLED displays for phones, applying for a number of related patents. One such patent covers iPhones with interactive, wrap-around displays, for example, while another deals with using flexible OLEDs to create a "pressable" display.